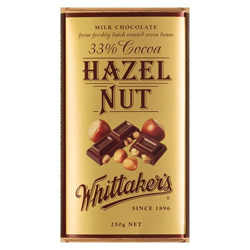 Creamy Fairtrade Milk Chocolate 33% Cocoa with roasted hazelnuts. Milk Chocolate (Sugar, Cocoa Solids 33%) (Cocoa Butter and Cocoa Mass), Milk Powder 30%, Emulsifier (Soy Lecithin), Vanilla Flavour), Roasted Hazelnuts 24%. Milk chocolate contains Cocoa Solids 33%, Milk Powder 30% minimum.